The New Real Estate Bubble – Or Something Else Is Going On? 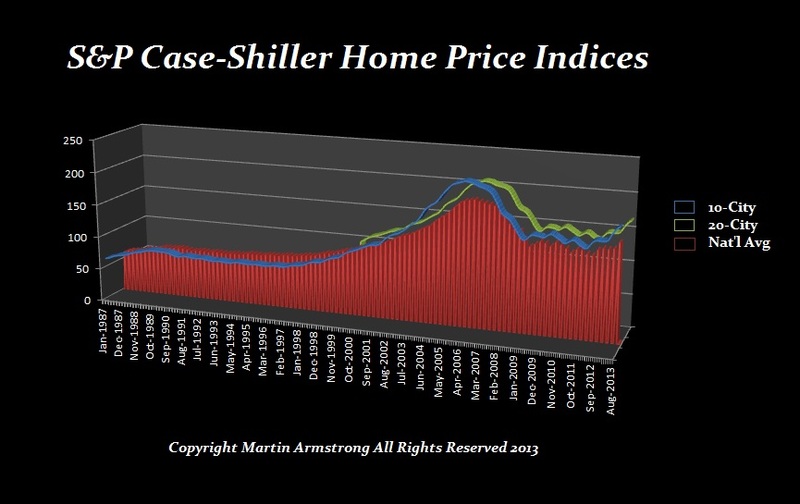 With the Economic Confidence Model peak in 2007.15 (February 26th, 2007), that turning point marked the very day of the high in the Case-Shiller Real Estate Index. 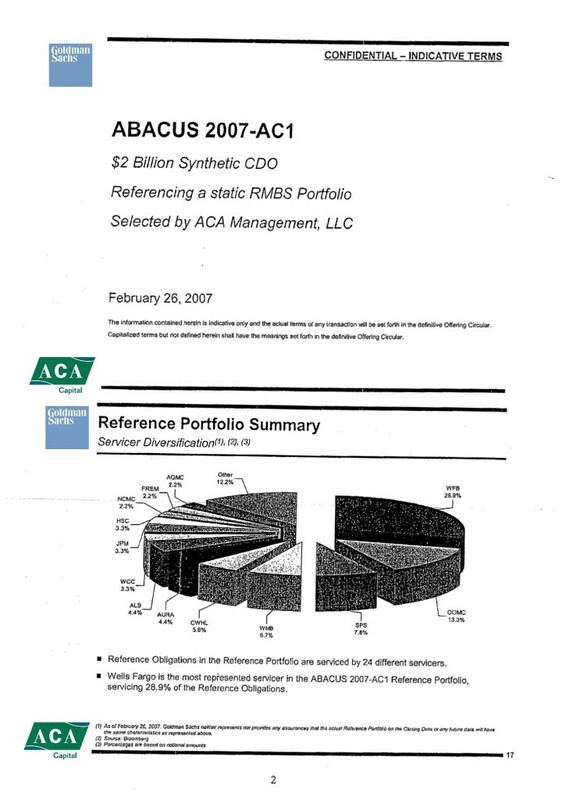 However, it also market the precise day of the infamous sale at the top of Goldman Sachs’ notorious ABACUS 2007-AC1 $2 billion Synthetic CDO. Indeed, Goldman Sachs was later charged with fraud by the SEC (SEC-Complaint-Goldman) precisely on the Pi target from the peak in the ECM. Many people assumed that Goldman Sachs was using our ECM to time to the day when to sell the whole Real Estate bubble. I cannot confirm or deny anything. I certainly did not advise Goldman. If they timed the offering with the ECM, what can I really say. That date was published back in 1985. February of 2007 was the peak of the US Real Estate Bubble. Even the Wilshire US Real Estate Investment Trust (REIT) Total Market Index set a record high of 6,501.40 at the time. Taking this index and creating a ratio to GDP show that the Wilshire US REIT/GDP Ratio stood at 45.7% in 2007 and crashed to 13.32% by 2009. Interesting, however, the Wilshire US REIT Total Market Index made new highs inf 2013. However, the economy has not recovered in the same manner and this ration only reached 39.9%. We reported in April 2014 that the high-end real estate was still rising. There was clearly a shift in the marked that we warned should unfold. The low-end of the market where the CDOs were focused, would not recover to new highs. We warned that new highs would be seen in many areas both East and West in the USA as a capital flight both from banks and Europe/Asia. Last week, the Wilshire US REIT/GDP Ratio reached a new all time high of 46%. This does not mean that the Fed has re-inflated real estate. In fact, that is not even close to what is happening. Real Estate is a highly diverse market that defies a single forecast. It requires splitting both into regions and then sectors within those regions. The high-end has been rising as a flight of capital both from Europe and from even China as well as Russia. The smart Europeans realize that they have to get their money out of the banking system. This is making real estate very attractive. You also have to understand that there is a new type of international money emerging and real estate is strangely part of it. First, the movable currency is becoming diamonds – not gold. Why? Gold cannot be transported through metal detectors and diamonds are replacing gold for that reason rising in price. Secondly, art has risen for 4 years in a row setting all time new record highs. Rare coins and stamps are soaring and all of this is again about capital flight into tangible assets. Thirdly, the high-end ticket real estate is being bought up in the USA by the Chinese. However, the largest number of buyers of real estate in the USA are Canadians. This is both a tax and currency play. Worldwide real estate has been rising generally. This is how all booms unfold. First there is the core, which the NY bankers fueled and burst in 2007. Then the buying spreads from that core into other sectors. What we are seeing is residential booms. Office space is still in a glut in many regions so I would not look at commercial without a positive existing guaranteed cash flow. This is not the hot area – it is residential – not the slums. CONCLUSION: This is not your typical bubble. This is about capital shifting. Laws like FATCA require banks to report all accounts. Shifting to real estate is getting off the grid.